It’s November. My husband and I just finished a hike through the meadow at Longwood Gardens Though the weather forecast promised warm afternoon sun, it’s gray, cold and misty. On a whim, I ask my husband to take a picture of this sign. The sign sits at a meadow entrance/exit. I’ve looked at the photo often, wanting to use it in the blog. But nothing quite clicked until today. George MacDonald’s sonnets for January 21-22 reminded me immediately of the sign in the photo. MacDonald is thinking about his heart as a garden in which the Divine Gardener has planted a bit of life. I’ve included definitions for unfamiliar words and images (hold pointer over highlighted words). And the unseen root clings cramplike unto thee. Across the infinite zenith of my soul. Thou art my south, my summer-wind, my all, my one. First, gardens don’t live charmed lives. They live unpredictable lives in a world they can’t control. So did George MacDonald: the deaths of 4 of his 11 children; a life of chronic tuberculosis (consumption), poverty, disappointment and failure. Second, I love the image of God as Divine Gardener. I’m adding it to my list! Here it emphasizes the faithful role of the Gardener from the beginning of life through whatever comes next. 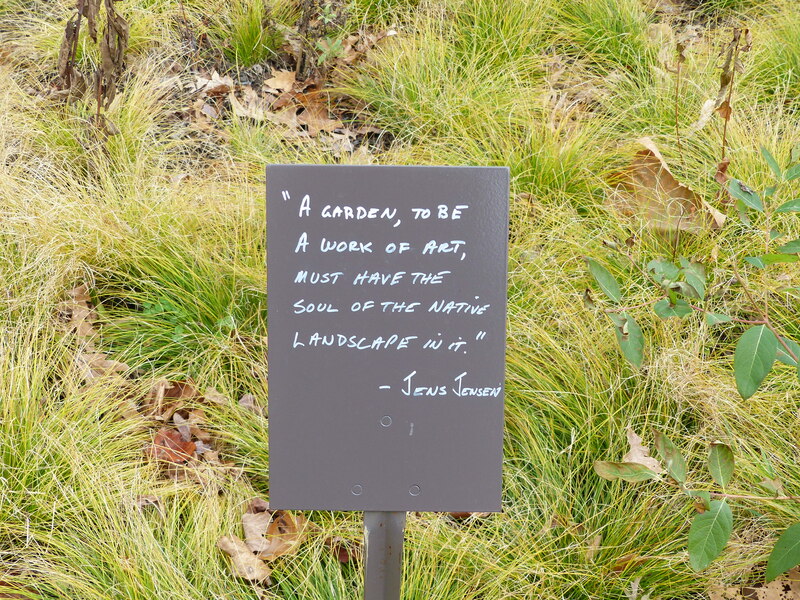 As the garden sign suggests: the Gardener cares for “the soul of the native landscape” that resides within every part of the garden and makes it what it is. You’re welcome, Cyril. Nice to hear from you! Thanks for this comment about new local churches. It’s a thought-provoking connection. Beautiful poem, and beautiful comments. Thank you, Waldo. I’m so glad you enjoyed it. Love the poem, Elouise. Thank you for sharing it, and your thoughts. You’re so welcome, Nancy. I’m glad you enjoyed the poem. Thanks, DV. And you’re most welcome. Yes indeed “Flower child”! So true. Actually, no trip to Longwood this week except in my imagination! I have, however, taken more impromptu naps in the last four days than I can count. Quite wonderful, actually! Today has been good. Still learning body speak. I think it changes every time my age ratchets up a notch!